Here at CELLINK, we want to inspire you to print more advanced models using the BIO X. In the following section, we demonstrate how to print a three-layered grid with GelXA SKIN and build a skin model. In this video, we demonstrate printing of three-layered grids with different infill densities using GelXA SKIN. The GelXA SKIN cartridges were placed in each of the three pneumatic printheads. All filaments were extruded through 22G nozzles at 5-15 kPa with 5 mm/sec on a Petri dish surface. Printhead 1 printed one layer with rectilinear pattern with infill density of 80%, printhead 2 printed two layers with rectilinear pattern with 20% infill density and finally, printhead 3 printed three grid layers with infill density of 10%. Printed layers of different infill density can represent three layers in a skin tissue model: epidermis, papillary dermis and reticular dermis, respectively. 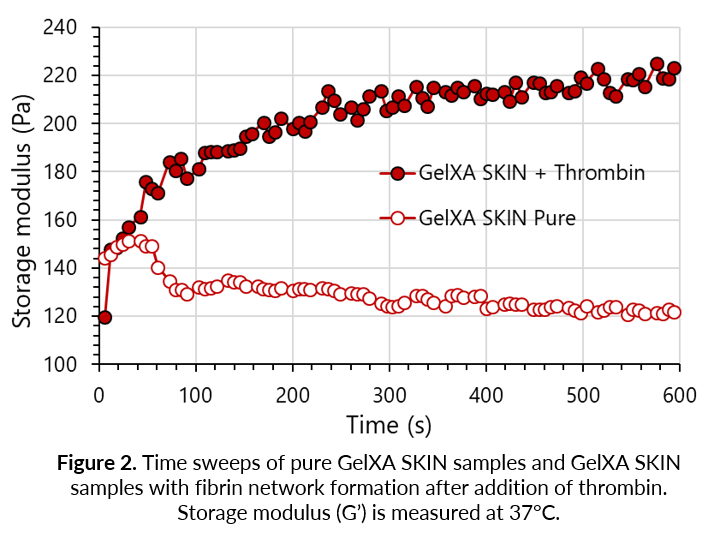 GelXA SKIN constructs can be crosslinked by adding our crosslinking agent enhanced with thrombin, which enzymatically converts fibrinogen component into fibrin, thus creating a stable network. After one medium wash, your cell laden droplets are ready to be cultured in standard cultivation environment. In addition, GelXA constructs can be also by photocrosslinked. The G-code to this three-layered grid structure can be found on Bioverse! The addition of xanthan gum improves the consistency and printing performance of gelatin-based bioinks. 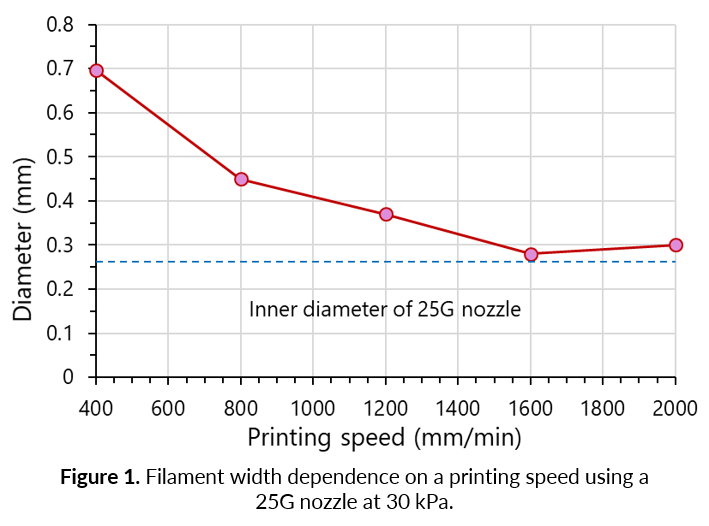 To minimize the difference between the width of extruded filament and inner diameter of the nozzle, GelXA SKIN is printed at high printing speeds and pressure close to 30 kPa (Figure 1). The smooth extrusion of continuous filaments enables you to print constructs with higher resolution and well-defined shapes. GelXA SKIN bioink incorporates fibrinogen, which forms a fibrin network upon the activation by thrombin. Figure 2 shows a rapid formation of fibrin networks in the bioink within 5 minutes from adding thrombin, as the overall stiffness increases in the range of 100 Pa. In the conditions without added thrombin, no network formation or stiffness increase was observed. The layered tissue models can be applied to a wide variety of tissues where distinct stacked compartments are wanted, for example skin. The dermis and epidermis layers i the skin can be modelled with three stacked compartments where the epidermis compose two layers with a fibroblast gradient. 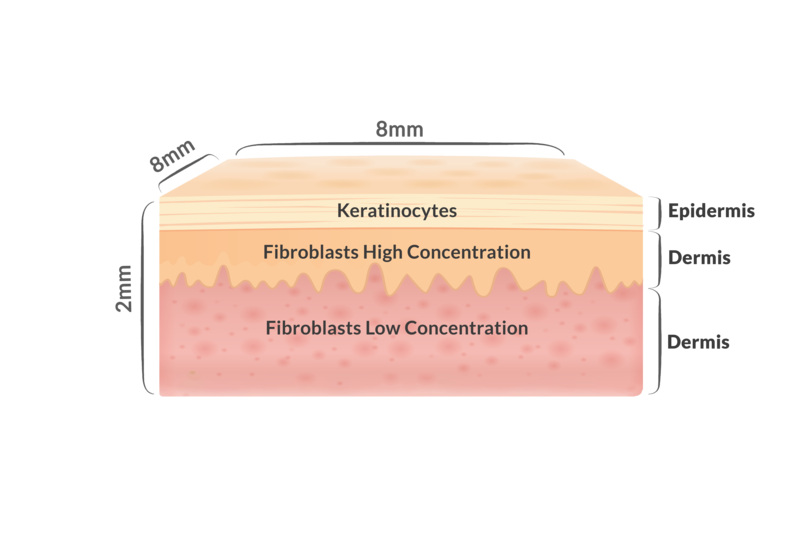 The first compartment being a one layer structure with keratinocytes to represent the epidermis. The second compartment contains one or two layers of a high fibroblast concentration to represent the papillary dermis and the third compartment, containing two or more layers with low concentration of fibroblasts, represents the reticular dermis. These constructs can, after crosslinking, be turned up-side-down and placed in an insert for cultivation in the air-liquid interface.